Walking the trail around the Walls is roughly like walking the edge of a kilometre square [but more interesting than this sounds!]. Each side in this square has a grand medieval fortified gateway called a “bar”. The trail is divided by these bars into 4 unequal corners. The corner that points north is the smallest and neatest corner, the only corner where the trail is always on the Walls. It is dominated by views of York’s large and beautiful Cathedral church, views often glimpsed through mature trees. It is the most walked corner, the wall-walk here has railings or wall on both sides and several of the towers [low, open topped and open backed –like all interval and corner towers] have benches. One part of this corner’s Walls is like a continuation of the wall in the north but there is also a twisting part, a lowish part with no railings and a tower built [uniquely in the Walls] of brick. There is no wall at all where the corner angle should be because here there was once a big marshy lake; here the trail runs beside a river and cuts off the corner. The buildings you pass by are a mix of church and state, domestic and commercial, Roman, medieval, Georgian, Victorian and modern. This corner is the longest. Overall it is shaped like a corner with the angle punched in, it is punched in where the Walls stop to cross two rivers and where there are the remains of two castles. Six roads cross the line of the trail in this corner [more than in the other three corners put together] –and three of these crossings have the remains of medieval gateways. 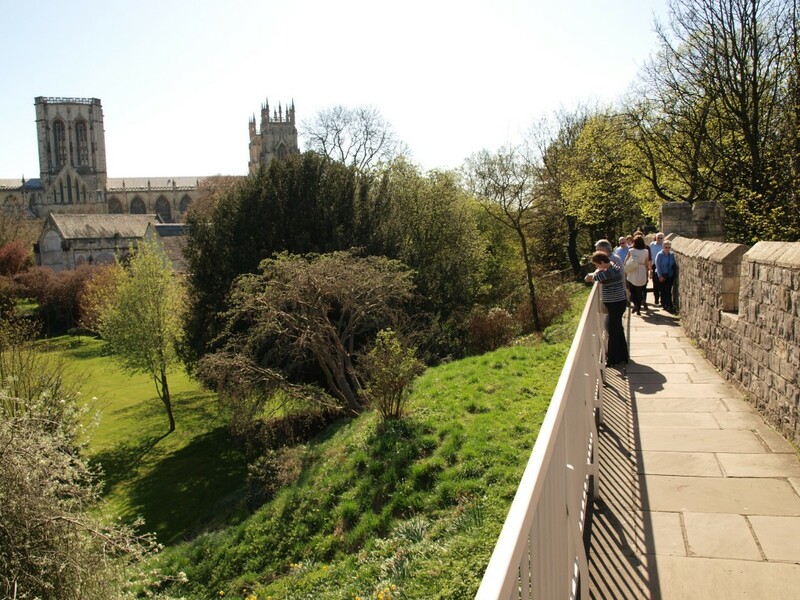 This corner is in two stages, south of the River Ouse the wall-walk climbs to its highest near York’s much admired Victorian railway station. Here it goes over arches built to let people get out of the city to this station –and over arches built to let trains get into York’s previous railway station! North of the Ouse the trail runs beside the Walls; Roman walls and other picturesque ruins are set in public gardens here. If you are selecting just parts of the Walls to walk then it helps to know more about the 4 main bars you will be choosing between, though they are all fine medieval buildings. This is in the north-west, it has the best background of any bar [when viewed from outside the city; the best view of any bar is usually from the front, from outside the city]. It is the only bar where the free trail takes you through the room above the bar’s archway and where that archway is still the main way through the Walls at that point. This is in the north-east, it is the tallest and strongest bar. It is the only one with its original medieval wall and windows surviving on the city side. It is the only one where you use the steep, low-ceilinged internal stairs to get to the wall-walk. If you pay you can go into its well presented and often hands-on museum to see its portcullis [complete with the mechanism to wind it up and down] and medieval toilet. 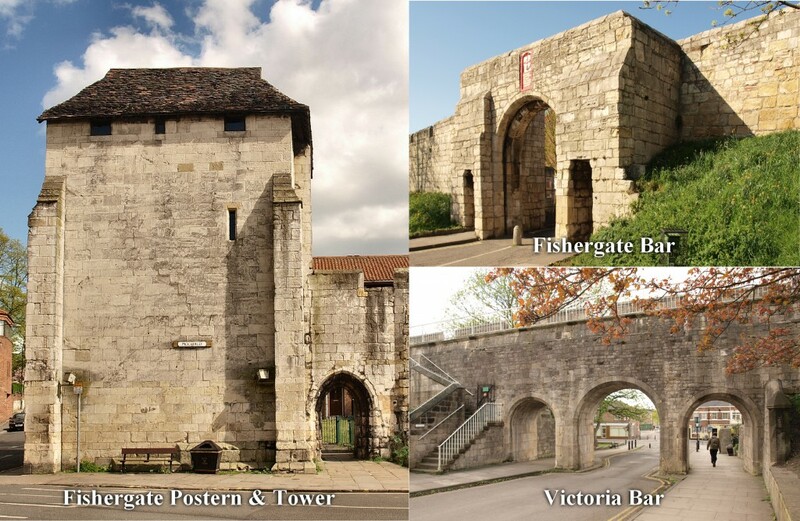 This is in the south-east, it is said to be the only city gate in England which still has its barbican. It is the only York bar where you can see clearly the [possible] scars of military attacks on it. If its café is open then you have access to its rooms and to the wall-walk around its barbican [as well as to fair-priced coffee and cakes! For details see “Refreshments, Seats & Toilets” in the Appendix]. This is in the south-west, it is probably the most pictured bar. 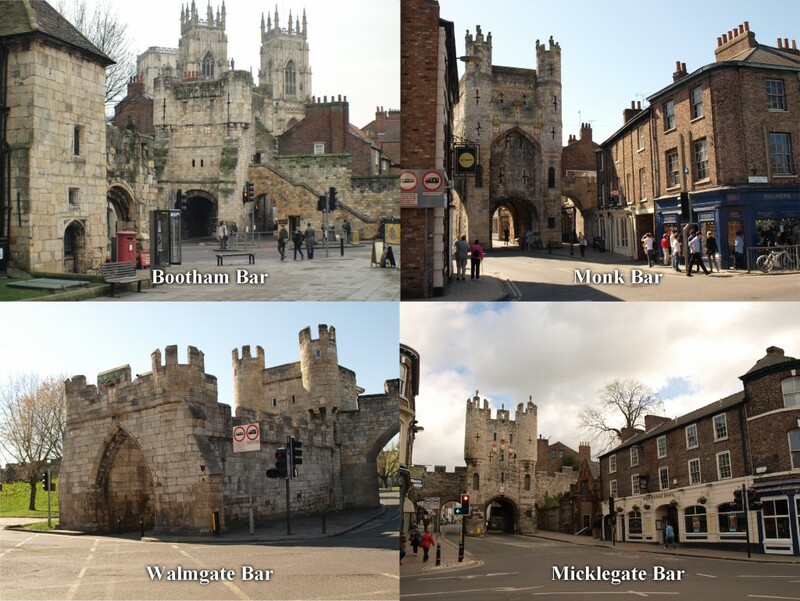 It is the bar where royal visitors are regularly greeted and some like the view into York from above its arch. If you pay you can enjoy its well-presented, informative museum [and cold drinks]. 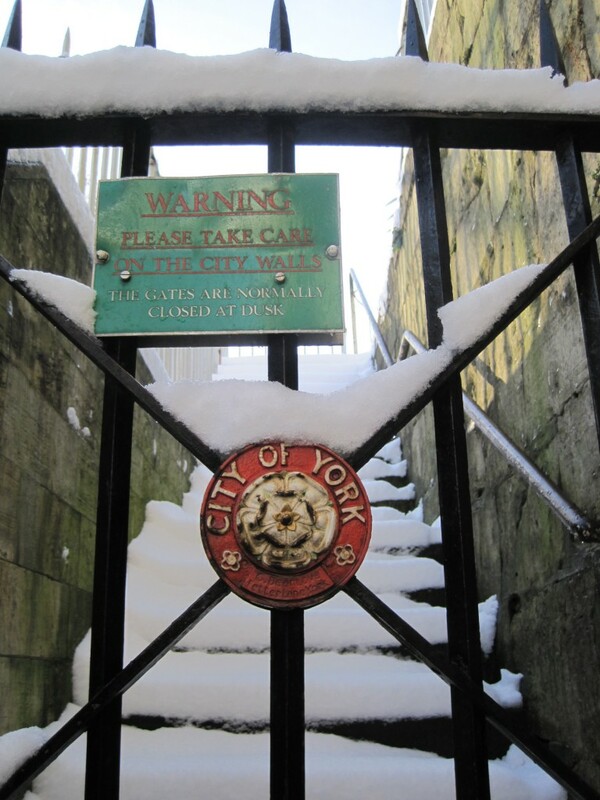 Friends of York Walls sometimes open the tall, roofed tower which guarded the postern [for details see http://yorkwalls.org.uk]. You can walk either way round the Walls; you can get up to them by stone steps at the four main bars, at the 3 minor gateways, at the four other places where the wall-walk ends and, oddly, from a sort of large island in roads 200 metres east of the railway station. For these last steps: start at the front of the station, with your back to the station go to your left using zebra crossings. Then continue along the pavement in front of the Victorian station hotel and its grounds till you come to a road junction controlled by traffic lights. Cross the road on your right first but turn left at the traffic island to cross again so you get to the pavement with a statue, then go under the Walls and the steps are on your left. 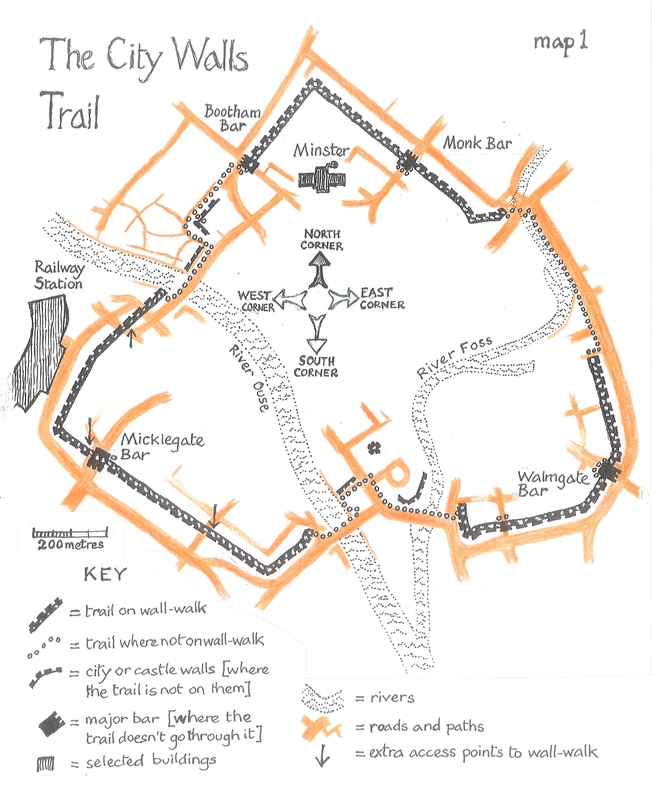 The trail has been written about as a clockwise walk and is divided into 13 sections starting at Bootham Bar, the north-west gate. Each section starts with the “basics” – these are for every reader, including those who want to walk the Walls speedily (taking, perhaps, a little more than an hour to walk the whole trail). “Basics” are followed by “details” – more details about this bit of the trail. Next come “views” – describing things that can be seen from the trail but which are beyond the Walls and ramparts come next. “Off-trail extras” are mainly less than 100 metres walk from the trail and many of these bring their rewards within 20 metres –they are for you to select from, if a section has more than one then they are numbered, the first being the one that involves leaving the trail first. At the end of each section of the trail come brief “stories”, we believe these to be true –with the obvious exception of the last! 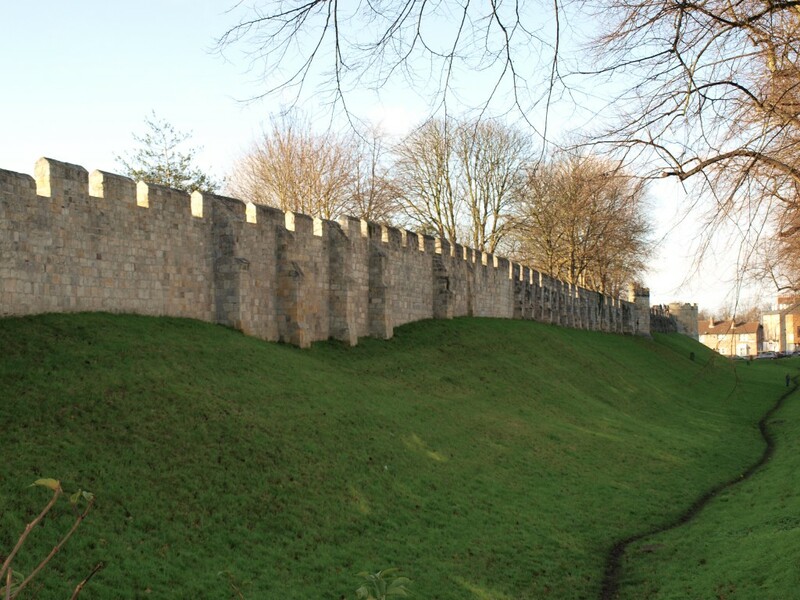 –they are certainly truer than the story you may have seen in the award-winning film “Braveheart” where Scots patriot William Wallace is shown leading an army that storms over York’s Walls. The Walls were never stormed, and Wallace’s army did not even get to York. For the individual Walls Trail Sections follow the links below.